Mix & Match Chairs. All Chairs are Used condition and have been checked for stability, lose joints etc Repaired where required. Timing and dates will be arranged with your directly if this is the case. New Stock Sale! Set of 1xTable+4xChairs @£106.99!!! Solid beech hardwood. Honest and trusted supplier of solid hardwood chairs to the trade and public. Sprayed, not hand painted, for a perfect finish. Finished with clear coat for extra durability. Chair for office,lobby room and kitchen,living rooms, dining rooms, bedrooms, courtyard, restaurant, cafe etc. Clear seat in color with wooden legs, clear chair lends a sleek and modern touch to your indoor or outdoor living spaces, very easy to clean and care for. New Solid Beech fiddle back Dining Chair. Solid beech hardwood. Honest and trusted supplier of solid hardwood chairs to the trade and public. Height to seat 45.5 cm. Width of seat 37.5 cm. Depth of seat 39 cm. Turned legs and stretcher, with a stunning bentwood back rest. Get Free Quotes. Marcel Breuer Cesca Bar stool. Condition are in line with age and use. Previous owner believes them to be circa 1970s. 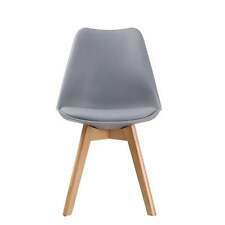 44 cm wide, 49 cm deep, 100 cm tall, 68 cm to seat. Overall in good used condition. 4 X Vintage/Antique Farmhouse Country Kitchen Chairs Painted in Off White. About 15 years old. Normal wear through use. Collection only. A set of four modern beech kitchen dining chairs. One of the seat covers has a small 'nick' on the front right corner - see picture. The seat pads can easily be removed and recovered if desired. Refurbished Painted Fiddle Back Farmhouse Kitchen / Dining Chairs. Painted in Annie Sloan paint in cream and waxed with clear wax. Chairs are individually Sold for £75 each chair. Painted in Annie Sloan White colour. Width of seat 37.5 cm. Depth of Seat 39 cm. Height of Seat 45.5 cm. 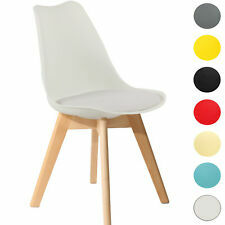 Price is £75 per chairs. Width of Seat 37.5 cm. Height of Seat 47.5 cm. Depth of Seat 39.5 cm. This is a pair of antique beech farmhouse carver chairs with cushions. The chairs are insturdy antique condition with age relatedgeneral wear, and havebeen recently sanded and oiled. Solid beech hardwood. Honest and trusted supplier of solid hardwood chairs to the trade and public. A set of six very stylish retro vintage italian chairs. Painted in cream and varnished. Dining chair solid beech wood ply seat and back metal frame stacking . We have 19 only in a natural beech finish as shown and 4 in cherry. Solid shock resistant beech wood legs. Charles Jacobs contemporary designed chairs. The Charles Jacobs dining chair provides a crisp, clean look to any kitchen or dining table. This chair features an ergonomic design with a contoured back that conforms to the natural curve of the human spine. Designed by Ercollani and manufactured by Ercol in early 60`s. seat height 42 cm. England mainland. 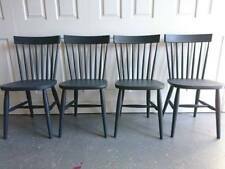 4 Beech IKEA Windsor style kitchen dining chairs in very good condition. This Ercol "Goldsmith" chair is an excellent quality piece of furniture, and it's an early blue label model from the very popular Windsor range. The original Ercol blue label is still present, but it's notably worn and tarnished. I believe in Beech (could possibly be pine), they have shaped front legs, double spindle supports to each side, single spindle support to rear and cross rail to front. 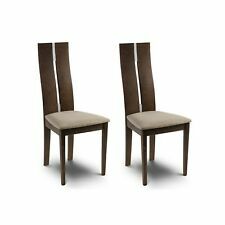 This is for a Pair of Ladderback Rush Seat Kitchen/Dining Chairs. Size 39cm wide x 42cm deep x 45/81cm high approx. (seat/back). Chairs are individually Sold for £75 each chair. Painted in Annie Sloan colour cream. width of seat 37.5 cm. Depth of seat 39 cm. Height of seat 45.5 cm. DINING CHAIRS DONT JUST HAVE A LOOK GOOD, THEY SHOULD FEEL GOOD WHEN YOU SIT ON THEM ,TOO OURS HAVE THE RIGHT PROPORTIONS TO BE COMFORTABLE ,EVEN IF YOU LIKE TO LINGER OVER DESSERT THERES CHOICE OF STYLES AND WE'VE DESIGNED THEM TO MATCH OUR TABLES IF YOU WANT TO COORDINATE YOUR DINING AREA. Painted in Annie Sloan colour Paris Grey. Height of the seat is 46 cm. Width of the seat 37.5 cm.